What is Your Coolant Reservoir For? If your car’s coolant reservoir is a mystery to you, you’re not alone. When you pop the hood of your car you may see a bunch of things you recognize and understand or you may see a maze of wires and hoses and have no idea what you’re looking at. If you identify with the latter, don’t worry you’re in good company. Even the most seasoned of mechanics tend to specialize in a particular type of vehicle or even a particular year range and if you present them with a vehicle they’re not familiar with, they can be just as confused as the average car owner. Every vehicle has the same basic purpose, to get you from point A to point B reliably and at least somewhat comfortably. The reality is, there is an endless number of different ways you can accomplish this task. This is even more evident today with the introduction of hybrid and electric vehicles that look completely different from any vehicles produced before them. This is still true even when you consider smaller systems in your car like the power steering system. Your car can assist steering with a hydraulic system or an electric system and that system can get your tires to turn using a steering gear or a rack and pinion and the geometry and placement of this system can be in many different places depending on the design of your car and where the engine and transmission are located. What is the purpose of a cooling system? One of the things that every vehicle needs is a cooling system. The cooling system in your vehicle removes waste heat created by the combustion process to keep the metals in your engine at a safe temperature so that it can operate for hours at a time without any damage. Your cooling system is filled with special coolant that is a mixture of water and chemicals that keep it from freezing, help lubricate the system, prevent corrosion and aid in heat transfer. This coolant is pumped through the system using a water pump which is either electric or powered by your engine via a belt and pulley. Your vehicle will also have a thermostat and radiator which regulate the temperature of the coolant in your engine by sending more or less coolant through the radiator to be cooled based on your engine temperature. One of the functions of your cooling system that you may not think much about is to maintain a constant pressure. 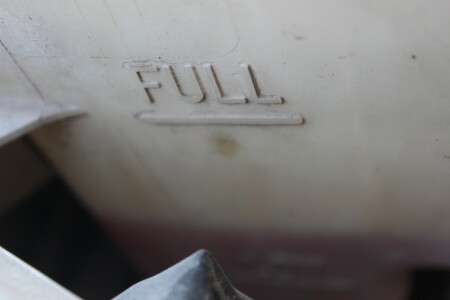 Like most things, as your coolant heats up as you start driving, it will expand. If your system is completely full of coolant this expansion will cause a rapid rise in pressure. Your radiator cap is designed to keep that pressure under a certain point to keep things from leaking and your cooling hoses popping off or bursting at a high pressure. 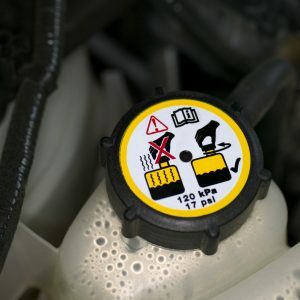 Once your system reaches operating pressure, the radiator cap will allow coolant to flow past it into the coolant reservoir maintaining the proper pressure. Then once you’ve stopped and your engine starts to cool, the opposite happens. As the temperature goes down and your coolant contracts, it creates a vacuum that can draw coolant back in through the radiator cap making sure your cooling system always stays full of coolant and has no air bubbles. What is the coolant reservoir’s role in the cooling system? Your coolant reservoir serves a very important role in your cooling system as it keeps your system full and free of air bubbles so it can operate at its full potential. Your coolant reservoir is also the first place you’ll be able to notice a leak. If coolant is leaking from your system, you’ll notice that even when your car is warm, the level won’t get quite as high in the reservoir. If you notice this happening in your car, make sure to keep your coolant reservoir topped off to avoid air being introduced into your cooling system. Also, take some time to identify your leak location and fix it quickly so you can get back to operating your vehicle safely. If you notice you have a slow head gasket leak, you can use BlueDevil Pour-N-Go to seal the leak and solve your cooling system problems quickly and easily. I use a long flexible brush like the one thats made to clean under refrigider bend the end into a a J like shape and adjust to fit and bend to get angle to clean the sides, Disconect the hose to radiator neck and collect antifreeze if you did not drain radiator first.